Includes: Delicious... The chocolate specialty with the exciting center. Chocolates with creamy center and whole hazelnut. 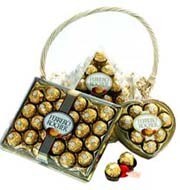 Ferrero Rocher Chocolate 24 piece,16 pcs ferrero and Heart shape.